"We are just at the beginning of a revolution in orthopedics," said Dan Gazit, PhD, DMD, co-director of the Skeletal Regeneration and Stem Cell Therapy Program in the Department of Surgery and the Cedars-Sinai Board of Governors Regenerative Medicine Institute. "We're combining an engineering approach with a biological approach to advance regenerative engineering, which we believe is the future of medicine." Gazit was the principal investigator and co-senior author of the research study, published in the journal Science Translational Medicine. More than 2 million bone grafts, frequently necessitated by severe injuries involving traffic accidents, war or tumor removal, are performed worldwide each year. 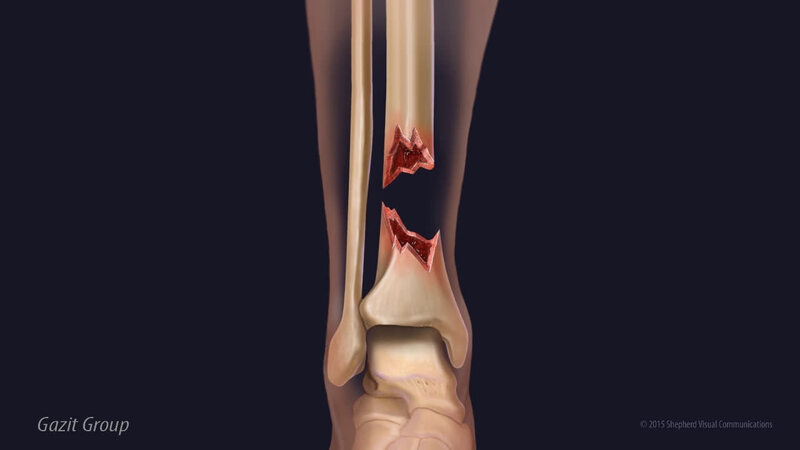 Such injuries can create gaps between the edges of a fracture that are too large for the bone to bridge on its own. The grafts require implanting pieces from either the patient's or a donor's bone into the gap. "Unfortunately, bone grafts carry disadvantages," said Gazit, a professor of surgery at Cedars-Sinai. "There are huge unmet needs in skeleton repair." One problem is that enough healthy bone is not always available for repairs. Surgeries to remove a bone piece, typically from the pelvis, and implant it can lead to prolonged pain and expensive, lengthy hospitalizations. Further, grafts from donors may not integrate or grow properly, causing the repair to fail. The new technique developed by the Cedars-Sinai-led team could provide a much-needed alternative to bone grafts. In their experiment, the investigators constructed a matrix of collagen, a protein the body uses to build bones, and implanted it in the gap between the two sides of a fractured leg bone in laboratory animals. This matrix recruited the fractured leg's own stem cells into the gap over a period of two weeks. 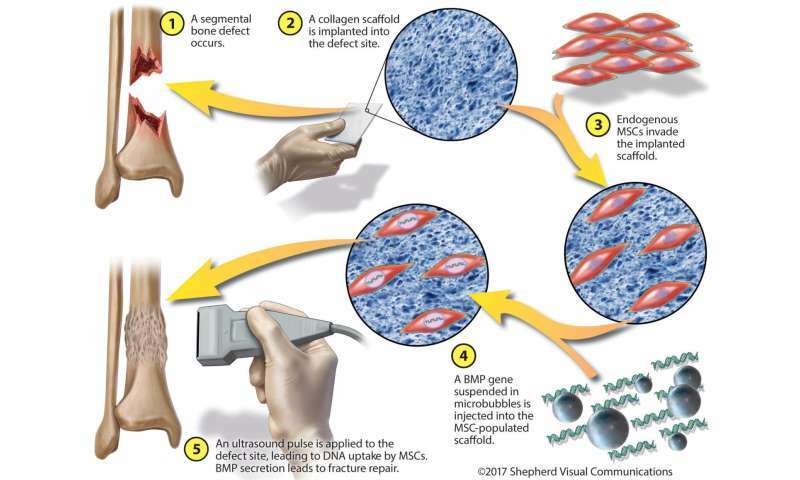 To initiate the bone repair process, the team delivered a bone-inducing gene directly into the stem cells, using an ultrasound pulse and microbubbles that facilitated the entry of the gene into the cells. Eight weeks after the surgery, the bone gap was closed and the leg fracture was healed in all the laboratory animals that received the treatment. Tests showed that the bone grown in the gap was as strong as that produced by surgical bone grafts, said Gadi Pelled, PhD, DMD, assistant professor of surgery at Cedars-Sinai and the study's co-senior author. "This study is the first to demonstrate that ultrasound-mediated gene delivery to an animal's own stem cells can effectively be used to treat nonhealing bone fractures," Pelled said. "It addresses a major orthopedic unmet need and offers new possibilities for clinical translation." The study involved six departments at Cedars-Sinai, plus investigators from Hebrew University in Jerusalem; the University of Rochester in Rochester, New York; and the University of California, Davis. "Our project demonstrates how scientists from diverse disciplines can combine forces to find solutions to today's medical challenges and help develop treatments for the patients of tomorrow," said Bruce Gewertz, MD, surgeon-in-chief and chair of the Department of Surgery at Cedars-Sinai.